This combination of X-ray and optical images shows the aftermath of a powerful supernova explosion in the Large Magellanic Cloud (LMC), a small galaxy about 160,000 light years from Earth. The debris from this explosion, the supernova remnant SNR 0509-67.5, is shown in a Chandra X-ray Observatory image (upper inset), where the lowest energy X-rays are shown in red, the intermediate energies are green and the highest energies are blue. In 2004, scientists used Chandra to show that SNR 0509-67.5 was likely caused by a Type Ia supernova, using an analysis of the elements, such as silicon and iron, that were detected. A Type Ia is thought to result from a white dwarf star in a binary system that reaches a critical mass and explodes. 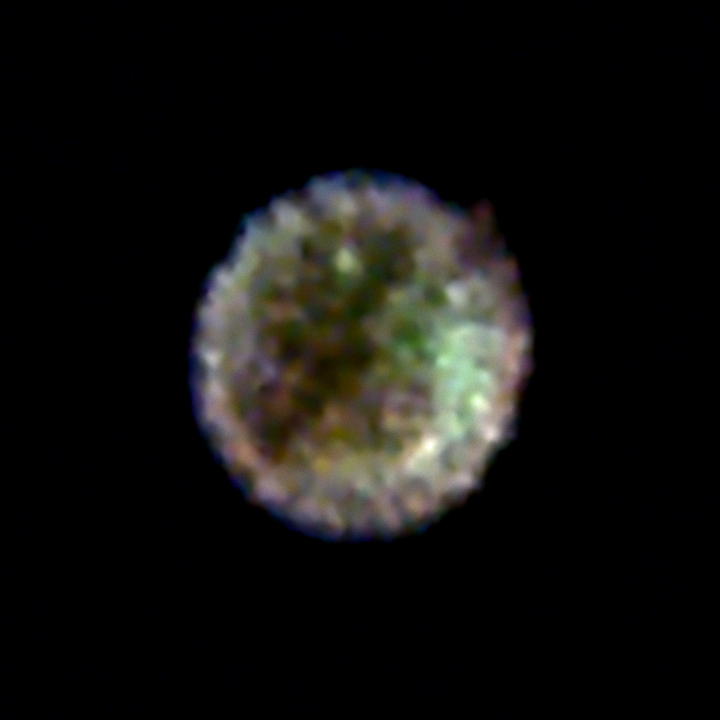 The light echo image (lower inset), from the National Science Foundation's Blanco 4-meter telescope at Cerro Tololo Inter-American Observatory (CTIO) in Chile, shows optical light from the original supernova explosion that has bounced off dust clouds in the neighboring regions of the LMC (the light echoes are shown in blue and stars in orange). The light from these echoes travels a longer path than the light that travels straight toward us, and so can be seen hundreds of years after the supernova itself. This image is one of a sequence of 5 images taken between 2001 and 2006 that are shown separately in a time-lapse movie. The large optical image is from the Magellanic Cloud Emission Line Survey (MCELS), obtained with the University of Michigan's 0.9-meter Curtis Schmidt telescope at CTIO. Emission lines of hydrogen (H-alpha) are red, singly-ionized sulfur is green and doubly-ionized oxygen is blue. The image highlights regions of star formation in the LMC, including supernova remnants and giant structures carved out by multiple supernovas. For the first time astronomers have used two methods - X-ray observations of a supernova remnant and optical observations of the expanding light echoes from the explosion - to estimate the energy of a supernova explosion. In two separate papers, astronomers concluded that the supernova occurred about 400 years ago (in Earth's time frame), and was unusually bright and energetic. This is the best ever determination of the power of a supernova explosion long after it was visible from Earth. In the new optical study spectra of the light echo, obtained with Gemini Observatory, were used to confirm that the supernova was a Type Ia and to unambiguously determine the particular class of explosion and therefore its energy. 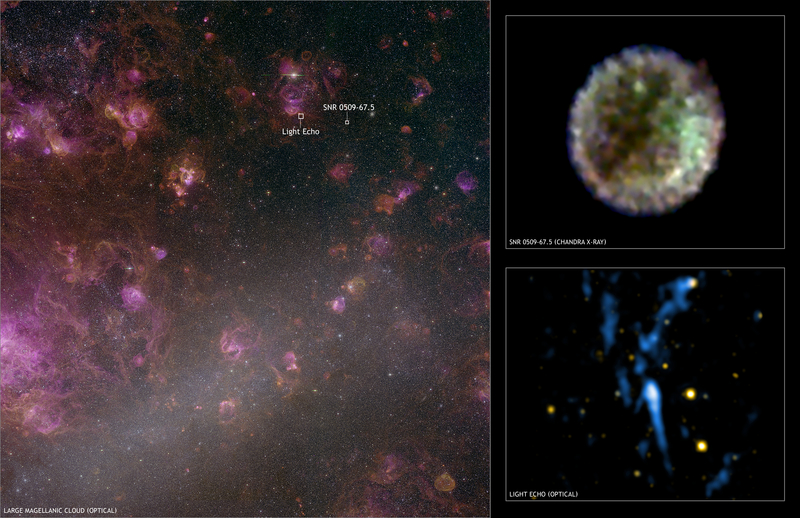 In the new X-ray study, spectra from Chandra and ESA's XMM-Newton Observatory were then independently used to calculate the amount of energy involved in the original explosion, using an analysis of the supernova remnant and state-of-the-art explosion models. The X-ray work also concluded that the explosion was an especially energetic and bright variety of Type Ia supernova, confirming the validity of the explosion models. Scale Chandra inset is 1 arcmin across.